Paperback, 7.75 x 10.5 in. / 116 pgs / 60 color / 21 bw. Text by Wiglaf Droste, Friederike Fast, Melanie Körkemeier, Kito Nedo. 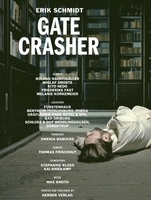 Gatecrasher presents the latest film trilogy by German artist Erik Schmidt (born 1968). The films explore various socio-psychological parameters of European society, such as the fraught German notion of Heimat, against a series of backdrops such as a hunting scene in the Westphalian landscape and the Bad Driburg spa resort. FORMAT: Pbk, 7.75 x 10.5 in. / 116 pgs / 60 color / 21 b&w.